COUCH ‘Julia’ via Posh Living. FLOOR LAMP Flos. BRASS TABLES Vintage. RUG Beni Ourain from Morocco. CHAIRS Vintage Bertoia Diamond Chairs. SHEEP SKINS The Line. CUSHIONS Linum. CEILING LAMP Tom Dixon. WALLS Painted in Farrow & Ball ‘Pavilion Gray’. Photos by Carolina Engman. OMG, OMG, OMG – I LOVE IT!!!!!! Wow!!! Amazing choice!! I’m in love!! That is your apartment? It’s so gorgeous! And I love that couch! wow that couch is amazing! I would definitely have this in my living room! Carolina your home is SO beautiful! We’re about to paint our walls a light, warm grey – I can’t wait! Obsessed with your living room! 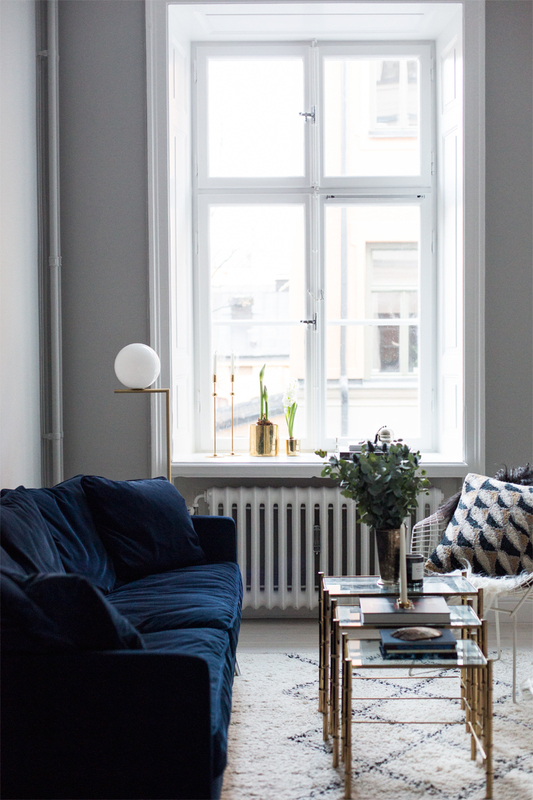 I’m going through the furnishing process as well for my new apartment, and am loving your photos for inspiration! Wow! Love this interior decor!! Perfect!! oh that Looks so beautiful!! 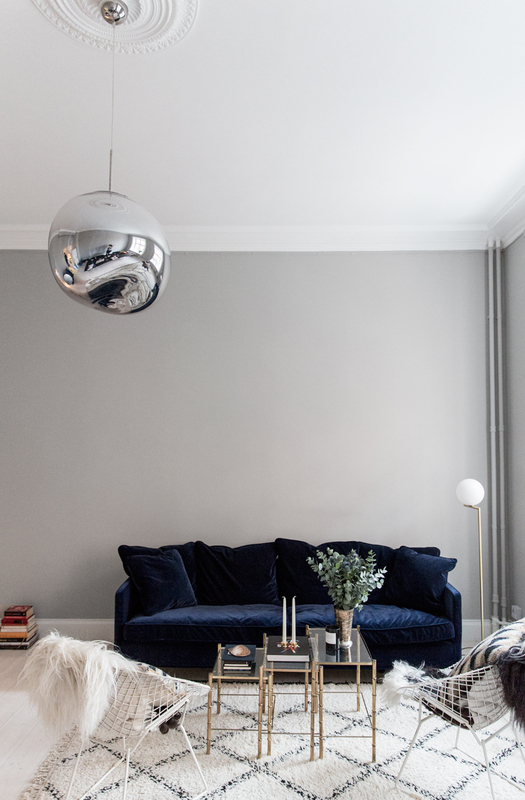 Oh wow this coach (and your whole apartment) is a total dream! Yes, it IS perfect!!! I love it way too much. That is my dream sofa!!! great choices, your place looks amazing. I love seeing your decoration posts ! Wow, that couch is absolitely gorgeous! I’ve been loving the minimal-looking interiors, but some of them could use a bit of colour. I think such couch does this job perfectly! That blue velvet is gorgeous. The color of that couch is just absolutely perfect! 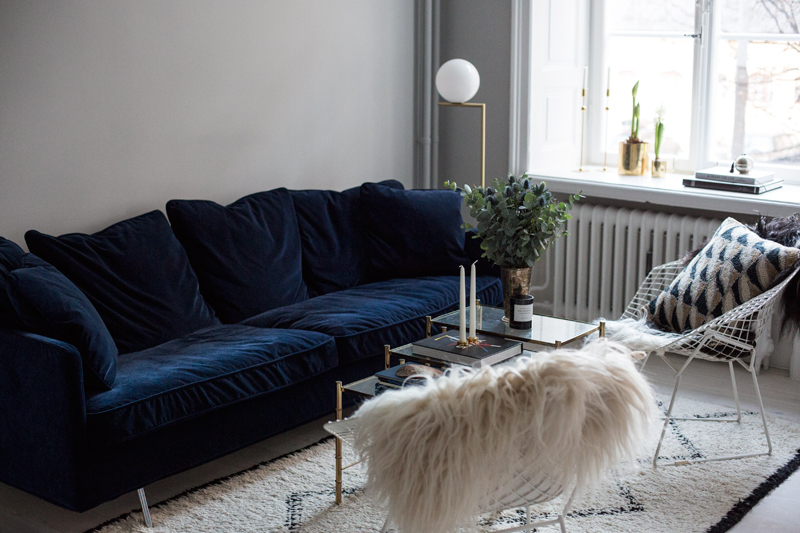 I love the idea of really bold statement furniture, and this dark blue is definitely eye catching. I love everything about it, but especially the chairs and coffee tables! The color of that sofa is Just perfect. Absolutly love it. I have bin looking for a fabric/color like this…. Do you remember the name of the fabric at furninova. ? Wondering the exact thing as the above poster. What is the namn of the fabric? Is it SITS’ own classic velvet? 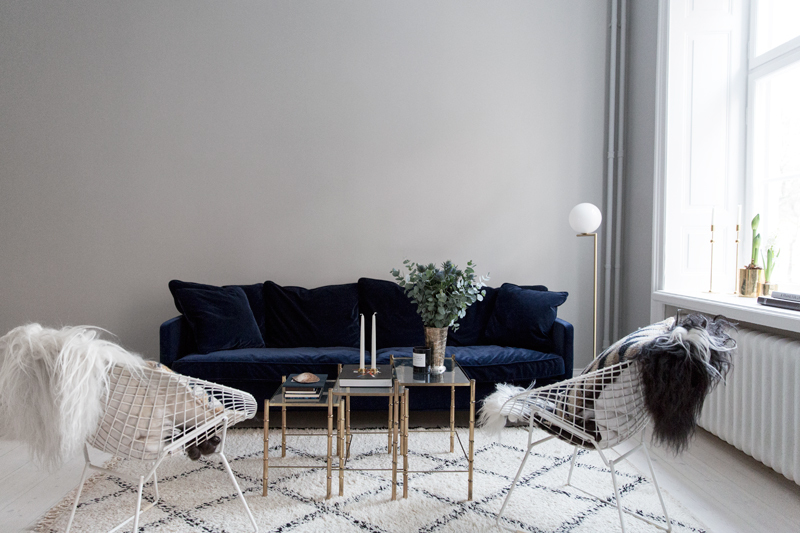 I’m dying to buy that couch but can’t decide on color, or rather what kind of blue velcet to choose. Marvellous! Just one very little suggestion, the plates on the wall is trendy! @delunaceramics C’est chic! Love your decoration posts! And that couch is just stunning, looking for one in velvet myself..
is there a place in the u.s. where one might be able to buy the couch? it’s just so beautiful. I just got a blue velvet coutch inspired by you. I als painted the wall behind it grey however it is definetely NOT the right color !! 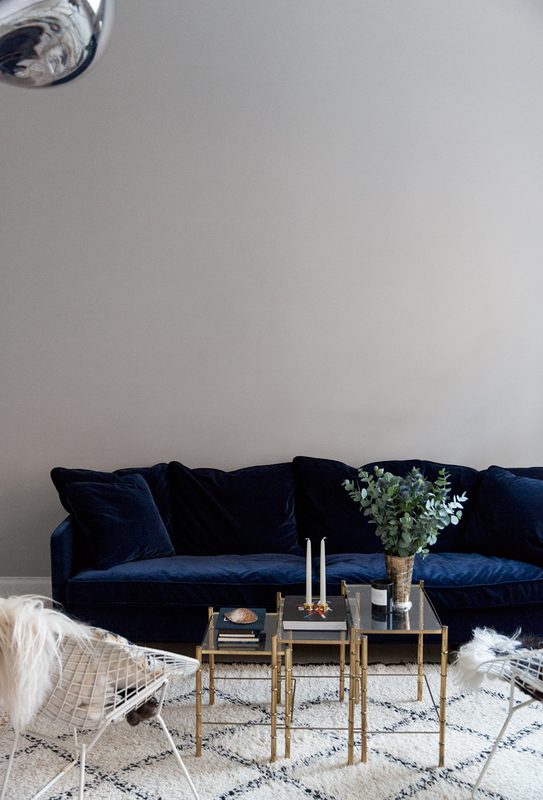 Can you tell me the RAL og NCS code of the grey colour you have painted on the wall behind the sofa in these pictures – It would be highly appreciated !! I love this couch so much! I tried to contact the company directly about purchasing it but it seems that it is only available in Sweden. Do you have any suggestions for me (I live in Boston)?